Here is the Fans Panel’s verdict after FC Halifax Town’s 1-0 win at Dover at The Shay on Saturday. Matty Kosylo’s returned from suspension to score the winner just before half-time to secure Town’s first win in 13 league games, and lift them up to 12th in the National League. Man of the match - Dayle Southwell, worked hard, created a few good chances and was unlucky not to score when he hit the bar in the first half. Moment of the match - Sam Johnson made a big save to keep the lead late on to prevent what would’ve been an awful result, although Dover would’ve thoroughly deserved a point. Moan of the match - The lack of real attaching threat was staggering, playing against a team bottom of the league and they were the better side, we badly need new forward players in. Man of the match - You can choose from any of the usual candidates. Today I’ll nominate Dayle Southwell. He leads the line well when actually given the chance, and was unlucky not to score on a couple of occasions. Moment of the match - Kosy’s goal was obviously important, but to me Southwell’s shot which crashed off the crossbar was also key. A second goal straight after the first would have put us in complete command, but it wasn’t to be. Moan of the match - The way we desperately defended at the end, you would have thought we were playing a top side, not the team propping up the rest. I understand the need to defend a lead, but there’s surely more to it than lining everyone up round the edge of the box? Anyway, congratulations to everyone at the club. Let’s hope we can kick on from here! Man of the match - Matty Brown, there were three serious contenders this week but I feel Matty Brown edged out Cameron King and Sam Johnson for this week’s award. 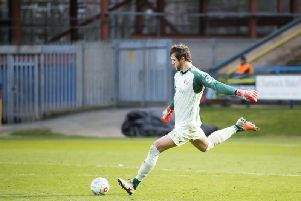 Matty always gives 100 per cent and looked really determined to keep a clean sheet on Saturday. Moment of the match - 39th minute, Matty Kosylo scored the winner with the aid of a slight deflection off a defender. Dover were really poor in the first half, it was important for the Shaymen to score the first goal when they were on top. Moan of the match - Dover were the worst opposition all season but almost pinched a point in the final 10 minutes. Sam Johnson saved the day with some decent goalkeeping as panic seemed to take over in the closing stages. The Shaymen can count themselves lucky Dover didn’t equalise.